Panda's Property - Moment is newly renovated. Centrally located in Tsim Sha Tsui, the strategic location allows easy access to transportation links, shopping and tourist attractions. 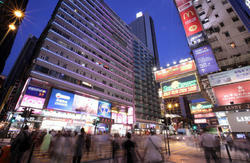 It takes only 45 minutes by bus from the airport to Tsim Sha Tsui Station. 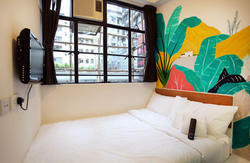 Panda's Hostel - Moment offers a high standard of service and amenities to suit the individual needs of all travelers. The hotel features chic design and clean room with separate toilets. All rooms provide modern amenities including air-conditioner, Wi-Fi and a flat-screen TV. If you’re looking for a comfortable and economical accommodation, look no further than Panda’s Property – Moment. 1) Panda’s Airport Transfer Services, chauffeur you to our property quickly, safely and stress-free. Single from: Benz(4 pax) HKD580, BMW(4pax) HKD450, Toyota(7pax) HKD700 Please visit below for more details. Go to the Citybus kiosk counter B10 to buy the ticket, or pay the exact fare in Hong Kong dollars in the fare box on the bus, then walk to the Ground Transportation Centre (on your right hand side).